Today I was at Safeway and they had blueberries on sale. Impulse buy! I knew that I had two large bananas that were banana bread fodder. 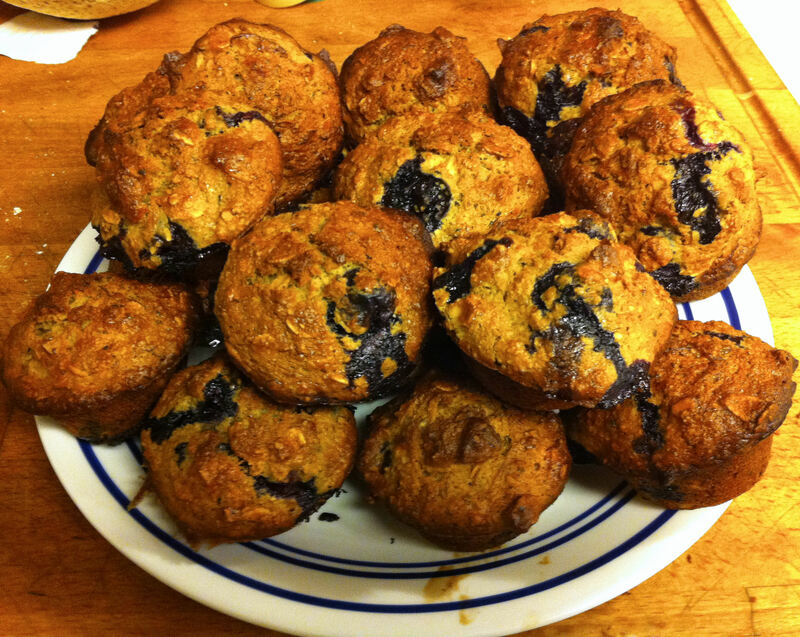 Why not put them together and use the disappointment of the oat muffins to try and make the perfect banana oat muffin? Tip: This is actually a critical step. You want to toast the oats but not scorch them. One thing I have done is is to sift out the oat dust from the raw oats before putting them in the pan, because this dust will burn before the rolled oats are toasted and give you a burned taste to your muffins. Underdone is better than over done in this case. You want most of the oats well browned, but no oats very browned. I could not taste the burned oats, but Jan said she could. 2. Take one cup of the toasted oats and put them in a blender and process them to a fine meal. Tip: you can sift the oat meal, flour, baking soda and salt together severl times to get a real good mix of the ingredients before adding the whole oats. 6. Add the whole eggs and mix well. 7. Melt the butter in a small cup and then let it cool for a minute. 8. Blend the melted butter into the wet ingredients, stirring constantly so that it does not cook the egg. 9. Fold in half of the flour at a time and mix just until there is no white showing. 10. Preheat oven to 350° F.
11. Fold in the blueberries and the nuts until just blended in. 12. Put 2 Tbs. of batter into each cup of a mini muffin tin and bake for 25 minutes (until an insterted tooth pick comes out clean. Tip: You may also divide your batter into 3-4 small loaf pans (3” x 5½” x 2”) and bake for 50+ minutes, until an inserted toothpick comes out clean. 13. When you mini muffins are done, remove them from the baking pans and cool on a wire rack.